Rex was born in Laura, South Australia on 7th August 1928, the last of seven children born to Richard Becker and his wife Emma nee Zanker. Rex was baptized on the 9th September and was one of the first children baptized by Pastor Ernst Stolz who had been ordained as a Lutheran pastor and then installed as the new Pastor of the Appila Parish a week before Rex was born. Rex said that Pastor Stolz must have been nervous. He baptized four babies that day and he actually baptized Rex as ‘Ray’. Rex’s eldest sister Rita was 20 years old and she loved to nurse and care for baby Rex. This was much appreciated by their mother Emma as her husband Richard was a sick man. Two years later Rita married Edgar Zwar who was also a member of the same Pine Creek Lutheran congregation. They lived about four k’s away ‘as the crow flies’, directly northeast over farming paddocks. Rex could recall that when he was four years old his mother lifted him up and sat him on a table and announced in German that he was now an uncle as his sister Rita now had her own baby they would call Melville. Rex enjoyed playing with his little nephew. One day Rex was missing and after much searching they found him on his three wheeler bike out on the main road on his way to visit Melville. Rex said he began going to school in Laura when he was five years old so he could go with his sister Linda who was in her last year and Linda could look after him as he could only speak German and she could help him learn some English. Rex said he was the only one of the children to begin school when they were only 5 years old. They went the four miles to school by a horse and sulky (a light two wheeler pulled by a single horse). During the day they left the horse and sulky at the home of Mrs McHugh who was a music teacher in Laura and taught Linda, and Rex thought she may have taught Rita too. Rex told me that all his memories of his father were as a sick man. He remembered the doctor calling regularly to drain the fluid from his father’s body – Dropsy/Oedema. When Rex was eight years old his father Richard died. He was 66 years old. Rex would go through some difficult times in his life but he had a strong faith in the love of God and a ready sense of humour that helped him to carry through life as it came to him. “The Willows” as the Becker home was named, remained the home and the family centre of the Becker families. Even when they married and left home they all lived nearby for some years. The love and care of her families was focused on Emma. To all the grandchildren she was affectionately called ‘Mutter’. We loved to go there for holidays. Grandmother Emma Becker would live for another 41 years after the death of her husband. Rex continued his schooling in Laura until the end of 1939. He said his family thought it would be good for him to have some religious learning while at school. Rex and Max Zanker would travel together the six miles to the Pine Creek Lutheran School and would pick up some of their Zanker cousins on the way. Rex completed his year 7 QC certificate in 1940 when he was 12 years old under the teacher Albert Fehlberg. Rex was looking forward to going to the high school at Gladstone in the new year. In January 1941 an exceptionally rare event in nature changed his plans. Two of Uncle Rex’s Zwar nephews, Melville and Glenn and a niece, Rhonda had come for a holiday, as their baby brother Kevin was in the Laura hospital fighting for his life. One day a freak heavy rain storm in the Appila district sent a giant flood down the Pine Creek and the floodwaters went through the Becker homestead and farm, nearly two metres deep though the Becker house. The three Zwar children were put on the top of a car shed roof and watched pigs and other animals washed away. The flood waters went through the farm buildings and some, including the sheep yards and shed were washed away. The cellar was filled with water and mud and were never opened. The main timbers of several bridges up stream washed down through the farm and took down some huge gum trees and these were left scattered over the farm. Most of the town of Laura was flooded too, but no one suffered as much as the Becker property as the Pine Creek takes a bend right next to the homestead and the flood waters went straight ahead and through the house and all the farm buildings. The three Zwar children were taken to Uncle Herb and Auntie Mary Schultz’s to sleep that night. Rex would be involved for most of the year in clearing up the mess the flood had made over much of the farm, including clearing fallen gum trees. One large gum tree was washed up next to the home garden. All of his brother Melvin’s 21st birthday presents were lost to the floodwaters. New sheep yards and a new shearing shed were built on a different part of the farm. For more details of the flood one can read Melville Zwar’s account of the flood. One can read newspaper reports of the flood in the newspapers of the time. During the year Rex attended weekly confirmation lessons in Laura with Pastor Roehrs. Rex was confirmed in the Wirrabara Lutheran Church which was part of the Laura Lutheran Parish, and was a separate parish from the Pine Creek Appila Lutheran Parish his family belonged to. Rex’s sisters and a brother were marrying and leaving home. Rex’s sister Frieda had married Rheinhold Wurst three months before the big flood and they had settled on their farm south of Appila. The following year his oldest brother Eric Becker married Anna Borgas and they lived on their farm west of Caltowie. Several years later his sister Linda married Walter Bartsch and they lived in Laura. By the end of the Second World War Rex and his older brother Melvin were left at home with mother Emma. I can recall the Becker Christmas celebrations held each year. They were usually held at ‘The Willows’ Becker homestead. It was a feast. It was about the only meal of the year when we ate roast chicken! The fowls on our farms were primarily kept for the money from the sale of eggs. These were the Great Depression and War years and each penny was precious. On the farms we regularly killed our own sheep for meat, and once a year a pig. One only shopped at the local butcher to buy sausages and maybe some mince meat. I can recall a Christmas session in the large Becker parlour room when I was only about three years old. One night Uncle Reinhalt Wurst showed some of his movie films in the darkened parlour room. I was terrified and cried as it was a completely new and unexpected experience for me. Grandmother Becker gave each grandchild a Christmas present. The Becker families would sometimes go fishing along the coast near Port Germein. The fishing net was kept at Rex’s. Over the years we tried different fishing spots. The families had invested in a long fishing net. I hesitate to guess it’s length. A few of the men would lead out into the sea pulling one end of the net until the water was up to their shoulders, then go parallel to the shore until the net was fully out and then pull their end of the net in to the shore. Hopefully a lot of whiting would have been trapped along with other fish and some large crabs. As children we played in the sea waters and in the sand dunes with our cousins. We children continued going to the Becker Willows homestead for holidays. The Pine Creek always had water running and included some long and deep stretches of water. We could go out in a rowing boat with our aunties and uncles. We also enjoyed fishing in the Pine Creek for yabbys. On one occasion Uncle Rex had slaughtered a sheep for meat and we were trying to catch yabbies’. Rex brought the head of a killed sheep over and put a long piece of string on it and lowered it into a deep pool. When he pulled it up after about 15 minutes it was covered with large yabbies. After repeating this several more times we had caught far more yabbies’ than we had ever seen! Uncle Rex would also take us out in the utility to feed the sheep out in the paddocks. It was hot summer time and the sheep needed extra feed. Uncle Rex would start the utility and set the choke to drive us at a very slow speed, and then he would jump up into the back to throw out the hay as we young children steered the vehicle round the paddock. There were also several sheep dogs on board and one day they took off after a fox and eventually caught it and killed it. One was an old dog and he had so exerted himself in the chase that now he collapsed and couldn’t stand up, so he had to be carried home. 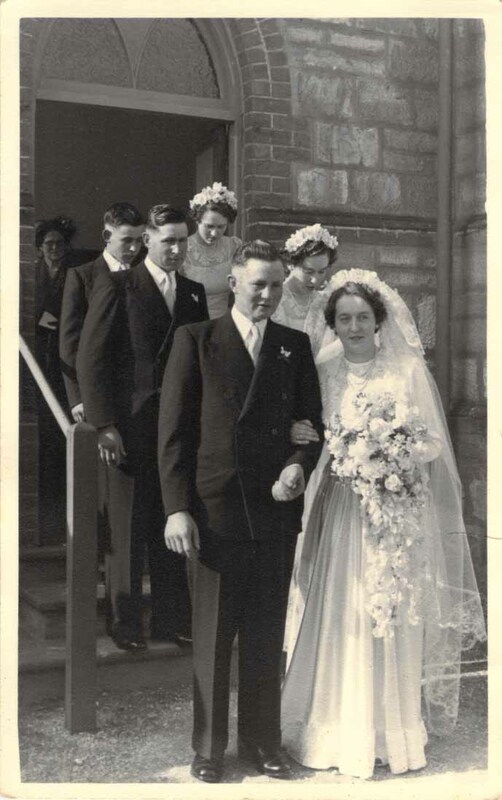 I was 11 years old when Uncle Rex married Auntie Grace Ottens, and I was thrilled to go to the wedding and the wedding reception. It was a rare experience for me at that age. My brother Melville Zwar was pleased to be in the wedding party of his uncle. He also milked the cows for Rex and Grace when they went on their honeymoon and says it must have been quite a challenge in those days for Rex to milk over 40 cows twice a day as well as working the property as a wheat and sheep farm. The marriage produced two children, Judith and Jeffrey. Several years after the wedding I went to Immanuel College in Adelaide. I didn’t realize it at the time but I would never live permanently at Laura again. After going to Immanuel I went to Luther Seminary in Adelaide for five years, and was then ordained as a Lutheran pastor in the Pine Creek Lutheran Church and then went to serve in the new Gympie Lutheran parish in Queensland. South Australia would never be my home again and I had little with the Becker family. It has always been a pleasure to meet up with Uncle Rex and Auntie Grace when on holidays in South Australia. I have found it is usual for those who move interstate that they often like to keep up with their family history. It is Uncle Rex who supplied me with much helpful information on his family during his life time, and I think we all owe him a special word of thanks. Rex Becker’s father Richard Becker bought ‘The Willows’ farm from his brother in September 1909. I think it was great that the recent Annual Becker Family Reunion in 2016 was held in Laura and a visit was made to ‘The Willows’ Farm. One hundred and seven years after Richard and Emma bought their farm their descendants still own land in a virtually unbroken line from the Rocky River near Laura that reaches eastwards almost to Caltowie. These properties include Valma Thomson, Melvin Becker, Rex Becker, Rita Zwar, Wayne and Peter Zwar, and Eric Becker families. The homes of Rex Becker, Rita Zwar, and their neighbours the Stakers, Westons/Zanker, and three families of the Saegenschnitters who were also Becker relatives, are all now empty houses or no longer even standing. These changes reflects the changes in the size of farms and families in our society over the past 100 years. After a family discussion in 1980, it was decided to sell the farm and move to Seaview Downs to be closer to the children. Both Rex and Grace quickly adapted to city life. As long as anyone can remember, Rex always had a great love of fishing. We can’t quite remember when be purchased his first boat, a small wooden craft with a very basic outboard motor, but over time his boats became larger, faster and more luxurious. He often commented that the size or style of the boat did not have much effect on the amount offish that he caught. Grace also.enjoyed her time on the water, and was always available for a fishing trip when the weather was right. When asked whether he had a successful day fishing, he would often say, no, but we had a lovely day boating. If he had a good catch, he would weigh the fish and compare the current price of his catch against the cost of the fuel he used on the day. Sadly, in 1994 Judith after a long battle with cancer, passed away at the tender age of 39 years, leaving two grand sons, Jack and Brett with her husband, John. The boys continued to be a great source of enjoyment to Rex. Judith’s untimely death caused both Rex and Grace a great deal of sorrow, Rex finding it difficult to accept that one’s child should be taken before the parent. After fishing, Rex also had a great love of working with wood. One of his first projects when moving to Adelaide, was to build a large purpose built workshop, fitted out with all the machinery and tools that would make some professional carpentry workshops look amateur. When he wasn’t fishing he spent most of his time in the workshop. And of course he also bought a bigger and better boat. He also took on several part time jobs, as he felt a little guilty not having a “proper” job at his age. The boss of a factory that he helped maintain quickly realized that Rex had many skills (gained from working out mechanical and other problems on the farm), and insisted that Rex assist the professional engineers with their problem solving. Rex had a very practical way of working things out. He was often asked to help sort out and fix problems on the boss’s yacht. Grace loved travelling, so in 1982 Rex fitted out a large F100 four wheel drive vehicle, and they took off on a trip around Australia. Then in 1984 they purchased a purpose built campervan and travelled to New South Wales and Western Australia along with many shorter trips. After putting their names on a waiting list, in 2005 they were told that a nice three-bedroom unit in Trinity Place, Pasadena was available. After some discussion, Rex and Grace sold their home (and boat) in Seaview Downs and moved into their new-home in Pasadena. Once again Rex quickly converted the garage into a work shop so he could continue his love of working with wood. With his ingenious skill he managed to make the work bench and other machinery mobile, so that it could be moved to make room for the family car. Rex did miss the boat, and the fishing trips, but understood that as he was aging, handling the boat was not as easy as it once was. Rex and Grace adapted well to the new village lifestyle. Grace involved in many church and community activities and Rex spending his time in the workshop. It didn’t take long for word to get around that if you wanted anything made of wood, or repaired, Rex was the man to see. In May 2016, while visiting his son Jeffrey in Melbourne, Rex suffered a serious accident resulting in a number of broken bones in his ankle. Following several spells in hospital and a long (far too long according to Rex) 90-day period on very strong antibiotics, he continued to suffer from a previous medical condition. He managed to get back to some kind of normal life, even driving the car for shopping and doctor’s appointments. He did however, get weaker, and after a fall early in December, he was admitted to hospital. He stayed at Flinders Hospital until the 17th December when he was transferred to Daw House in Daw Park where he continued to receive special, comforting care. Rex passed away peacefully on Monday the 19th December, 2016. On Tuesday 3rd January 2017 Trinity Lutheran Church was filled with many relatives and friends in a service of thanksgiving to God, led by Pastor Mark Kaesler, for the life of Rex Becker. Rex had two brothers, Eric and Melvin, and four sisters, Lorna, Rita, Frieda and Linda who all pre-deceased him. We remember Rex for his great sense of humour, his wonderful generosity and his friendship.